Resource management software relieves you from the manual tasks of spreadsheet management for allocating and handling resources in your organization. This software helps with the real-time data for all the users in your organization, and it is easily accessible from your location using desktops, laptops or smartphones. You can create and configure custom reports and graphs for analysis of your organization’s project and resource management data. This, in turn, helps to achieve the organization’s goals efficiently. Resource planning software helps you to forecast the requirement of resources depending on the projects in the pipeline. You can accordingly decide to recruit new resources, retrain or reallocate resources. It helps you to manage last moment hiring activities and at the same reduces staff turnover. This software also integrates easily with other systems in your organization along with multiple data sources. Resource scheduling software is very user-friendly with easy to use drag down features available. You can easily schedule the resources for the particular tasks using this software and can also share the workloads properly on different resources. 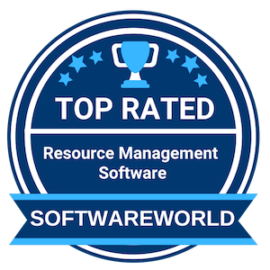 Below, we have listed the 10+ best resource management software that are trending in the recent times. What are the Best Resource Management Software in 2019? About Deltek Vision : Deltek Vision is a project-based solution for professional services firms that combines project accounting, resource management, project management, time/expense management and client management in one product. Deltek Vision is a web-based solution available for cloud or on-premises deployment. “What I like about Deltek Vision modules are purchasing and asset management because they allow me to track purchase orders and fixed assets; It helps me to get new business, improve performance and optimize the operations of our company. Important business data in real time.” – Nereida B. About Ganttic : Ganttic is high-level, online resource planning software, which can be used for managing a project portfolio, while also planning resources with maximum efficiency. With Ganttic, you can create clear and comprehensive visual plans that give you an instant overview of all your resources and projects. Ganttic is highly flexible, designed to be used in whichever way that fits your organisation’s needs. “What I like in Ganttic is that anyone can create tasks and dependencies easily and understand a planning within a glance thanks to its structured and colorful UI. Another advantage is that it is web based and thus doesn’t require a specific software.” – Laura F.
About eXo Platform : eXo platform is an open-source social-collaboration software designed for enterprises. It is full featured, based on standards, and extensible, and it has an amazing design. Our aim is to build a strong collaboration culture by offering our users complete groupware solutions that allow them to switch quickly between tools in a single collaborative digital workplace. Our platform helps co-workers exchange information and knowledge faster through team collaboration and project workspaces. “Love the UI. Big number of add-ons and features. Very reliable. It was very easy to use once I got the hang of it. A little intimidating at first but doesn’t take long to get used to. Great way to interconnect. Very well put together. I am able to save time at work.” – Alex R.
About Accelo : Accelo is the smart technology platform that gets you back to doing the work you love by automating and streamlining work into one, integrated system. With Accelo client accounts, projects, timesheets and more, everything is tracked for you – so you can spend less time in meetings and dealing with admin work. By streamlining your operations, you and your team will be free to dedicate your full attention to your clients while being more productive, profitable, and confident. “Love the ability to see all tasks and drag and drop through deadlines. Love being able to track a project from proposal stage through quoting through project management and billing. Unique and totally awesome end to end product. Oh and awesome email integration.”- Adam S.
About Forecast : Forecast is an AI powered resource & project management platform for companies that care about delivering projects on time, on scope, and on budget. Forecast helps you see into the future, enabling you to make the tough decisions before they become serious and costly problems. We believe software should be smarter and more connected by providing one-click real-time insights into project data. About Opphound : Opphound is a sales pipeline and resource management system that offers professional service businesses a simple and secure platform from which to manage project resources as well as prioritize sales opportunities. Incorporating visual, planning and reporting tools, Opphound aims to provide users with an effective sales pipeline and resource management solution. About Sinnaps : Sinnaps is the first intelligent management tool, capable of planning your projects automatically according to their specific needs. Its exclusive technology uses a powerful rendering engine based in PERT (Project Evaluation and Review Techniques) and CPM (Critical path method) algorithms, in order to help you optimizing your project management as well as assessing you on important decisions. About Teamdeck : Teamdeck is an employee-focused complete resource management solution for agencies and software houses. Our mission is to improve companies’ HR processes such as planning resource allocation, measuring the utilization and forecasting the capacity. At the same time, it’s a tool for the employees to manage their availability, request vacation days and track their time. “Teamdeck is great for small and midsize businesses. Easy UX. It gives a good picture on the overall pipeline with projects and team utilisation + gives us an idea how much work we can get and if we need to hire more people.” – Velislav I. About Slenke : Slenke’s mission is to help create a connected workplace and give people working in it a simpler way to get work done. Slenke is the easiest way for companies to securely communicate, share files, manage projects, organize tasks, track time and more. Through intuitive and easy to use features it allows businesses to manage project portfolios, individual projects, tasks, internal communication, time tracking, invoicing and file sharing. “Our main work driver for us every day. We use it extensively for team communication. Makes it easy for us to organize projects because of having everything related to our projects in one place. One of the things I personally very much like is Slenke’s Private Chat for team members, we don’t really use email between the team.” – Tyler S.
About Tempus Resource : Tempus Resource is a solution that takes specific aim at solving the resource management challenges faces by organizations of all types, shapes and sizes. We replace spreadsheets and can connect if needed to the leading PPM tools. When implementing a resource management framework, it’s important to use a solution that doesn’t over complicate the underlying processes. Capturing data should be simple and just like excel. “I love how this program allows me and my team to work in our day to day projects as well as our long term needs. We use this product to work in our HPBX system deployment. Really Easy and powerful tool! ” – Jose M.
About Epicflow : The Epicflow software analyzes the workload of the team members and prioritizes tasks based on demand. By regularly allocating resources between multiple projects, Epicflow improves business performance; and with automatic re-scheduling, project managers can spend less time managing while achieving greater output. Epicflow SaaS platform works in tandem with existing PM systems such as MS Project, Primavera, Trimergo, Jira, and other. About PDWare : PDWare(tm) is a provider of dynamic resource and work planning solutions for strategy and portfolio execution. ResourceFirst, our flagship product, emphasizes prioritization, feasibility and execution as the pillars of successful project and program delivery. ResourceFirst™ is available for cloud and on-premise installations, providing first-line managers, executives, PMO and EPPMO functions the agility to meet fluctuating work priorities, schedules, demand and staff capacity. » Human Resource Software - Human resource software refers to an information system through which many systems are combined to ensure easy management of human resource in offices and companies. There are many enterprises – both big and small that take help from human resource management software to process any form of data or any business gimmick. » Talent Management Software - Talent management system software is a single solution if you want to track efficiently, manage, and improve individual as well as team performance. You can easily drive your organization’s performance with it in real time. » Asset Tracking Software - Asset Tracking Software has become a necessity these days where time is of utmost importance. This software helps you to manage you to track the movement of your IT devices and software within your company. » Applicant Tracking Software - Applicant tracking software is the useful software for the HR department which one is helpful for recruiting and hiring process for the company. Whenever we apply online for any companies, our resume isn’t typically sent to the recruiter directly.